Get the Funk Out! : 10/8/18 - Post show conversation with Emmy Winner Jenni Gold - considered a triple threat in the world of entertainment. Janeane will be speaking with Jenni about her latest project, CinemAbility - part a love letter to Hollywood, an industry that has consumed my life, and partly a wake-up call. 10/8/18 - Post show conversation with Emmy Winner Jenni Gold - considered a triple threat in the world of entertainment. Janeane will be speaking with Jenni about her latest project, CinemAbility - part a love letter to Hollywood, an industry that has consumed my life, and partly a wake-up call. Compelling, star-studded, historic documentary CINEMABILITY: THE ART OF INCLUSION for coverage consideration? The perfect entertainment story for October’s National Disability Employment Awareness Month. Director Jenni Gold, the 1st wheelchair using female in the Director’s Guild, shares this entertaining and fascinating 120 year history of disability representation in film and TV - very much like THE CELLULOID CLOSET but with more humor! 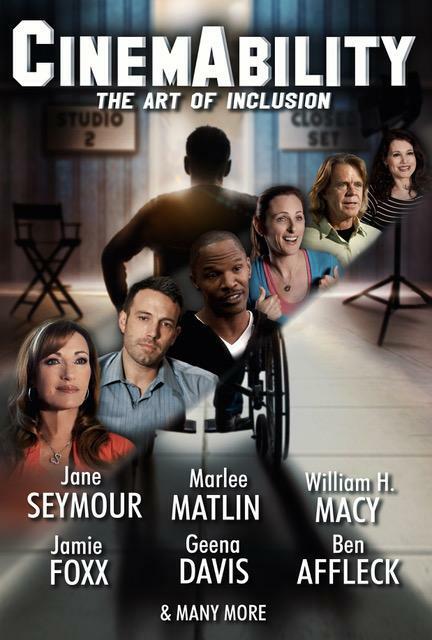 Features Jamie Foxx, Ben Affleck, Marlee Matlin, Jane Seymour, William H. Macy, Geena Davis and so many more! CinemAbility: The Art of Inclusion reveals a compelling and often amusing look at the history of disability portrayals in entertainment. From the early days of silent films to present-day Hollywood blockbusters, this historic film takes a detailed look at the evolution of “disability” in entertainment over the last 120 years by going behind the scenes to interview celebrities, filmmakers, and studio executives. With heart and humor, CinemAbility: The Art of Inclusion utilizes clips from Hollywood’s most beloved motion pictures and television programs to shine a light on how the media impacts society and the monumental effect these portrayals have on inclusion. CinemAbility is in part a love letter to Hollywood, an industry that has consumed my life, and partly a wake-up call. Growing up as a wheelchair user I found many of the representations of people with disabilities on screen to be confusing. I remember every year my family would watch Affair to Remember when it aired on TV and I always found it odd that after Deborah Kerr became a wheelchair user she could no longer pursue the man she loved. I remember hating the sappy Movie of the Week style representations in the 70’s and 80’s. The person in the wheelchair was always syrupy sweet or angry and bitter. It wasn’t until Friday the 13th part 2 came out that I saw a wheelchair user the way I wanted to be seen. He was a cool teenager hanging out in the cabin in the woods just like everyone else, he had a girlfriend just like everyone else, and right before he was about to have the night of his life, he got killed by Jason, just like everyone else. His disability was not the topic and was not a factor in his story line. As a filmmaker who loves the rich history of Hollywood, I realized that a historical overview of disability portrayals had never been done, and that’s certainly one of the aspects of the project that drew me in. It was fresh and exciting, but as we continued to research and interview more people about their recollections of disability portrayals in film it became clear that this was not the whole story. There was more behind these characters and depictions than the stereotypes that emerged, which in some instances are still adhered to. In fact, what we found was much richer, in that there is a strong correlation between these depictions and how people with disabilities are treated, and as portrayals have become more well-rounded and realistic, actual people with disabilities have become more accepted socially, and more integrated into society. Being a director with a disability and the only DGA wheelchair using director member, the last thing I wanted to do was make another cookie-cutter documentary about disability. But soon I realized that a film like CinemAbility must be made, and if not by me then who? I knew this story first hand and I knew how to tell it. So, slowly I started to pitch it and soon I was interviewing A-List Academy Award Winners, Academy of Motion Picture and Guild Presidents, Producers, Studio Executives and the Showrunners of some of the hottest shows on TV. Hollywood heavyweights came to the forefront because these are caring people who are interested in good causes, and they realize inclusion is important. They all had something viable and important to say and even had some personal realizations that I caught on camera. By connecting the dots between how people with disabilities are portrayed and how they are perceived in public, we were able to broaden the story beyond disability, to any minority group that has at one time or other been underrepresented or misrepresented in our media. We show how Sydney Poitier films impacted an entire Civil Rights Movement and how Will & Grace opened the door for homosexual civil rights. But where did that leave people with disabilities. I found out very quickly that the changing of portrayals of disabilities in the 80’s lead us toward a major victory in 1990 with the signing of the Americans with Disabilities Act, but after a backslide in these depictions, we might be able to get into the building, but what was the perception of people like me once we were in it? Would there be job opportunities if perceptions were still based on the understanding one gets from what we see in the media? It suddenly became clear to me that this film was much more important than just recapping the history of a few interesting characters in the history of film, but about documenting the shaping of perceptions of minority groups through the media. And in doing so, I created a platform to do some reshaping of my own. This film has the ability to break down these stereotypes in a way that had never been done before. And most importantly it is done in a fun and entertaining way! People normally hear about a disability-themed documentary and they run for the hills, but those brave enough to take a peek are shocked to find they have a good time and laugh while also being challenged intellectually. As a storyteller, that is my entire goal. When we started this project over a decade ago, disability was not included in most diversity initiatives, but that is now changing due to new crop of talented, passionate & determined actors with disabilities who have stormed into Hollywood and aren’t taking “no” for an answer. Enlightened Showrunners and Producers are also starting to take chances on stories, characters, and actors that are “different,” and yet it still remains that hardly anyone with a disability is working behind the scenes in Hollywood. It seems to be the perfect time for CinemAbility to open people’s eyes to something new. DIRECTOR’S BIOGRAPHYEmmy Winner Jenni Gold is considered a triple threat in the world of entertainment. Her editing and screenwriting skills serve as a foundation for her directorial efforts which have received multiple awards and have placed her among the best in her field. As the only female wheelchair using Director Member of the Directors Guild of America, Jenni is the co-founder of Gold Pictures, Inc, a development and production company which was established in 2001. In addition to directing the award-winning film CinemAbility, Jenni has become an expert on the power the media has in shaping perceptions, and is an advocate for total inclusion. She serves on the advisory board of the Geena Davis Institute on Gender in Media and has produced a number of films and corporate web series, servicing such well-known clients as The Christopher & Dana Reeve Foundation. Jenni recently co-produced the soon-to-be-released film Tiger starring Mickey Rourke and Janel Parrish, and she is in post on a horror/comedy film which she directed titled, Aaah Roach, starring Casper Van Dien, Grace Van Dien, Barry Bostwick, and Jason Mewes. Jenni has also co-written and is developing a number of narrative feature films including the suspense thriller Adrenaline and a family film, Lucky. Jenni was also interviewed along with many other high-powered female directors in the newly released documentary This Changes Everything about discrimination in Hollywood.